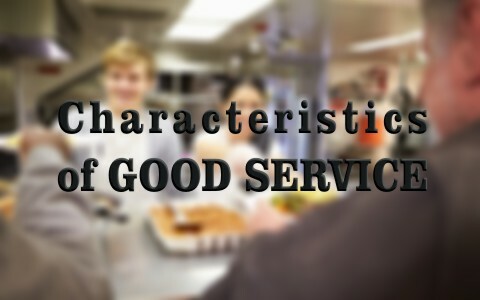 What Are The Characteristics Of Good Service? We live in a consumer based society. Whether it is the latest phone, television, or just simply going out to eat several times a week. In fact, many economists tell us that in America, our economic base has changed from farming, to manufacturing, to consumerism in a little over a hundred years. But, if you stop to think about it, if people are consuming goods and services, whom are the people doing the serving? And, why do they serve? But the real question comes down to: What are the characteristics of good service? Whom are those that serve? Do you ever go to a restaurant and get bad service? If so, what was it about the service that was so bad? Was the server standing around looking at their phone? Were there a lot of people there? Or, was it perhaps because the kitchen was slow or understaffed? The reasons could be endless, but the fact is, no businessman ever got rich by hiring people to serve that do not care about good service. Behind the scenes, there are many people that serve others. Unfortunately, if you look at job postings for customer service related positions, you will find that many employers do not pay a whole lot of money to people they hire to provide good customer service. It makes you wonder that despite the platitudes about caring for customers, one would think that if someone really cared about their customers, they would seek to find people that are truly motivated to serve others the best that they can and pay them well for doing it. Unfortunately, many of these “customer service” jobs are a revolving door of employees coming and going, with some exceptions. These exceptions are the ones that truly care about serving others. They may be the ones that stay in their position for years and their customers even get to know them by their first names. You see, for many, customer service is about serving. And, as you get to know these people you find that although they would like to get paid better, they still stay where they are, doing their best to make others happy by serving them. Why do people serve others? For the most part, those that consistently serve others have a servant’s heart. By this I mean that deep down inside they truly desire to meet the needs of others and to make others happy. It may be because they were raised in a home where they saw someone that did the same. Or, perhaps they are someone that is truly happy about life and express it by making others happy. No matter what the cause, the overwhelming majority of people whom consistently serve others is because it is in their heart to do so. What does the Bible say serving about others? Serving others requires a willingness to invest our self in the lives of others (Galatians 6:1-2): We must first serve others by being forgiving and helpful to those mired in life issues that are not in keeping with what God would want for them. In other words, we must realize that everyone has their own struggles in life. In my experience with counseling others, many people have never asked for help because no one ever offered them any help. Instead, it is most often the case that those who claim to care for them are not there for them when the person needs help the most. Sadly, this is very true with many people who claim to be Christians. This is often because either someone is not biblically equipped to offer help or they are not willing or patient enough to invest of themselves into the messy burdensome lives of others. We must realize that when we are willing to serve others we are directly fulfilling the law of Christ to love God first and our neighbor as our self (Mark 12:28-34). Serving others requires humility (Galatians 6:3-4): Too often, people will not invest into helping others because they are too proud. It is easier to stand on the sidelines and point fingers and gossip about how someone lives their life than it is to actually humble our self and help them in a way that is not condescending or judgmental. We must realize that when we are willing to serve others, we must demonstrate humility. This encourages those in need that someone really cares about them, which usually makes them want to learn more about the hope that lives within the person serving them (1 Peter 3:15-17). Serving others requires us to help others grow closer to Christ (Galatians 6:5-8): At the end of the day, we can serve all the people in the world, but if we are not motivated by helping others to know Christ and develop a relationship with Him, it has no eternal value (1 Corinthians 13:1-4). We must realize that our goal is to help them to know Christ and Him crucified (1 Corinthians 2:1-5). Doing this with humility, it assures that Christ gets the credit for the miracles He will do in their life, not us. To do any less would make a mockery of God and our faith, which in many cases can directly contribute to the eternal destruction of those we claim to want to serve. Serving others requires patience to keep at it, no matter how long it may take (Galatians 6:9-10): Serving with patience reveals what is in our hearts. The fruit of the Spirit is love, joy, peace, longsuffering, gentleness, goodness, faith, Meekness, temperance: against such there is no law (Galatians 5:22-23). This fruit is the barometer of our love for Christ because of what He did for us (1 John 4:19-21). When we love Christ, we allow Him to inspire and enable us to serve others no matter how long it may take. This is the very essence of longsuffering and temperance – continuing to serve no matter how long and hard it may be. When it comes to good service, it demonstrates a willingness to invest in the lives of others; it demonstrates humbleness; it strives to help others grow closer to Christ; and it demonstrates patience and steadfastness. Ultimately, our ministry to serve others should demonstrate our love for Christ above all things. I like to get to the heart of the matter. Since, “… whatever you do, do all to the glory of God [1 Corrinthians 10:31]”, that would include all service. And, “… when you have done all that you were commanded, say, ‘We are unworthy servants; we have only done what was our duty.’ [Luke 17:10]” (the word “duty” literally means what we “owe”. What we end up with is this: Good service is doing what we “owe” God as servants in order to glorify Him by nothing less than proving that though we are unworthy of any self glorification, we should glorify God in all we do. Previous post: Why Do Some Christians Not Go To Church? Next post: Why Do Christians Act So Un-Christian?